The tennis team is playing for a spot in the NCAA finals this afternoon at 6:00 PM Eastern. You can follow the action here through a live scoreboard and streaming video. The Dawgs beat Ole Miss yesterday in impressive 4-0 fashion. Today they face the No. 1 team in the land, UVa. The Hoos have held that ranking all year. They look a lot like Georgia did last year, with the #1 singles player, #1 doubles team, and two other guys in the singles top 20. (That #1 singles player is Somdev Devvarman, who battled John Isner all last year for the #1 spot.) And like Georgia of last year, Virginia comes in undefeated. "I'm not really trying to think about what we did last year or what they did. I am more focused on how we are going to beat them tomorrow and what we are going to come out with. I think all our guys are fired up, obviously going into the National Championships as favorites. 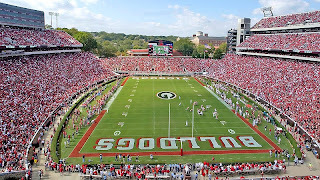 With that being said Georgia is a very good team, they are obviously playing very well right now. I have full confidence in all our guys, regardless of rankings or who's favored or not. I think all our guys are going to come really fired up. I am really looking forward to a good match tomorrow." Not to take anything away from UCLA or Texas, but this match is the one college tennis fans should be watching. UVa has been unbeatable all year and the Dawgs look healthy, talented and motivated, playing some fantastic tennis in the past week. We just beat UVA, thanks for the link, watched the scoreboard all night!! Texas next for the NCAA National Champs! I don't understand how we win 4-3 when there are 9 matches? How's this scoring work? One point for doubles. The rest of the points come from singles play. UVA won the doubles. Way to call it Anon. I still don't see how four singles wins plus one doubles win = 4 points. Why isn't it 5-4? UVA won the doubles point by taking two of three doubles matches. Several years ago, doubles matches were reduced from three team points to one.